This tutorial goes through the steps of setting up the server side of an iOS mobile app with Swift, including the code and commands for the project. While coding and drafting “Mobile app with a Serverless Backend,” we came up with an idea to use Swift on the server-side for an iOS app (it’s an interesting use case) to cater to the full stack Swift developers out there. The same is true for the Android version of the app as well. As an initial step, I started exploring Swift actions under Functions (FaaS) on IBM Cloud. My first challenge was to authenticate the user through the AppID service, and this should entirely happen on the server-side in a Swift action. I figured out that there is an introspect API endpoint which will validate the token your pass. This is good, can I use external packages like SwiftyJSON inside a Swift Cloud Functions action? This will be answered soon. ** App ID Service on IBM Cloud. result["ERROR"] = "Authorization headers missing." result["ERROR"] = "Authorization header is malformed." result["ERROR"] = "missing a required parameter for basic Auth." let loginData = loginString.data(using: String.Encoding.utf8)! result["ERROR"] = "Invalid Token or the token has expired"
You can find other actions here. From the architecture diagram, you should have figured out that once we are authenticated, the next steps are to add the user through one of the actions and then save the feedback provided by the user along with his device id (to send push notifications). 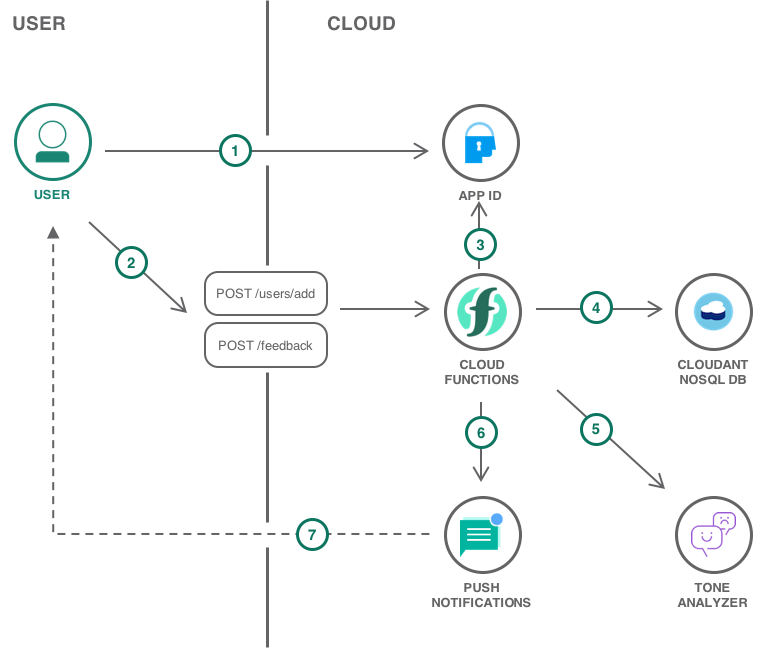 There is a trigger associated with the feedback table so that once a new feedback is added to the table, the trigger will be triggered to send the feedback to Watson tone analyzer, and the output tone is passed to Cloudant to map and send the associated message as a push notification to the feedback provider/customer. When you create a Swift action with a Swift source file, it has to be compiled into a binary before the action is run. Once done, subsequent calls to the action are much faster until the container that holds your action is purged. This delay is known as the cold-start delay. To avoid the cold-start delay, you can compile your Swift file into a binary and then upload to Cloud Functions in a zip file. As you need the OpenWhisk scaffolding, the easiest way to create the binary is to build it within the same environment it runs in. Copy the source code and prepare to build it. (Optional) Create the Package.swift file to add dependencies. This example adds swift-watson-sdk and example-package-deckofplayingcards dependencies. Notice that CCurl, Kitura-net, and SwiftyJSON are provided in the standard Swift action so you can include them in your own Package.swift. You can see that hello.zip is created in the same directory as ValidateToken.swift. Refer to this link to install the Cloud Functions standalone CLI. The time that it took for the action to run is in the "duration" property; compare it to the time it takes to run with a compilation step in the validateToken action. So, what will be the performance improvement when I run an action with a .swift file for the first time and an action with a binary file? auth-validate is an action created with the .swift file and authvalidate1 is an action created with a binary file. Don't forget to refer our other solution tutorials covering this end-to-end use cases and scenarios.